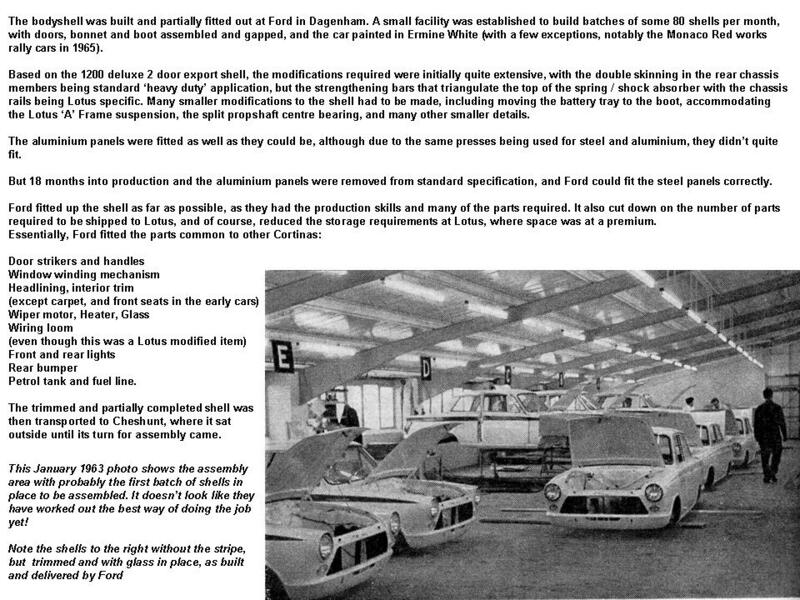 This section looks at Cheshunt, the home of the Mk1 Lotus Cortina, assembled there from 1962 until 1966. 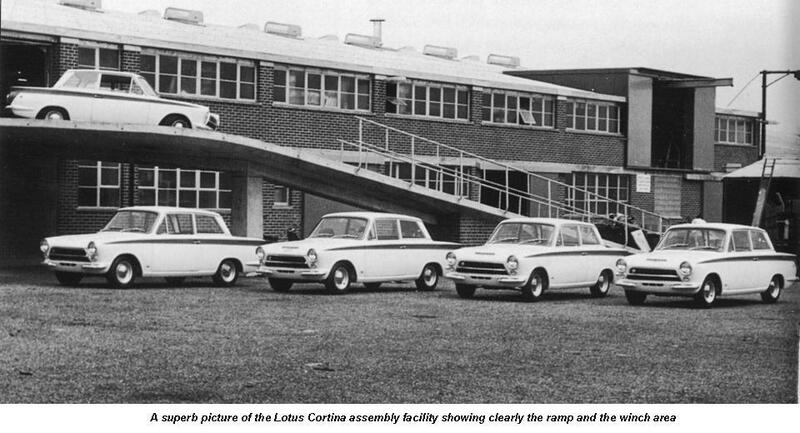 In 1966 Ford stopped making the Mk1 Cortina, and this coincided with Lotus moving to Hethel. 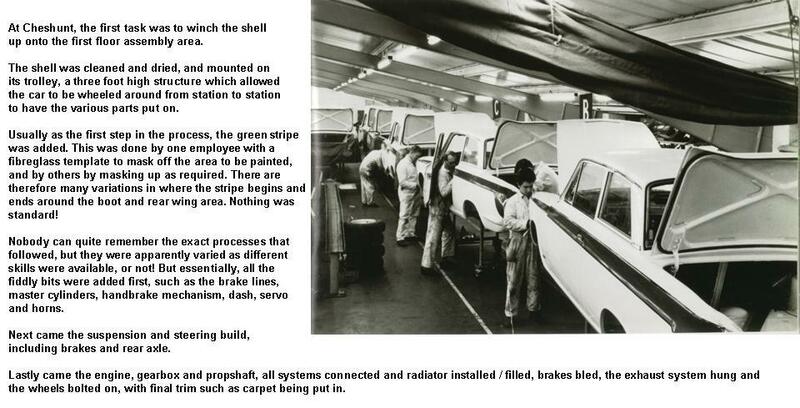 Subsequently, the Mk2 Lotus Cortina was made in Dagenham, with the Lotus Twincam engines shipped in from Lotus at Hethel. 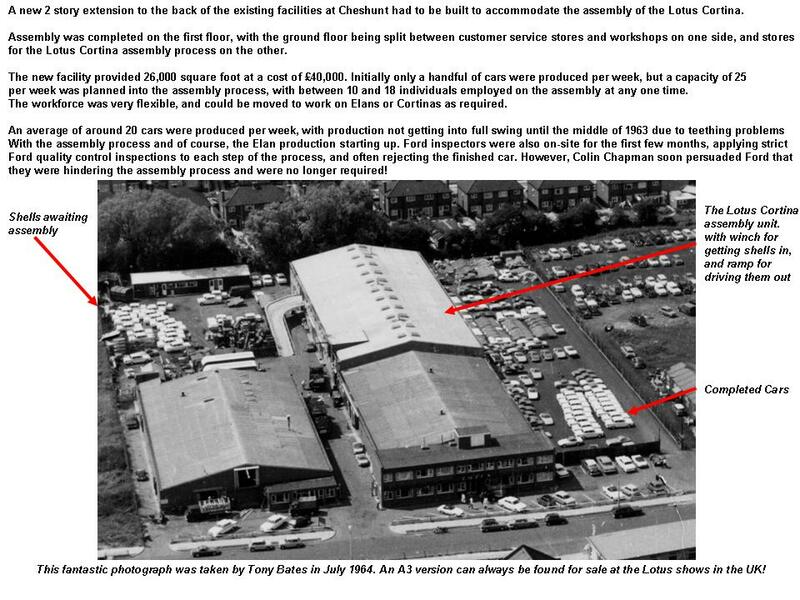 The factory layout is described below, together with an overview of the assembly of the Mk1 Lotus Cortina. Nothing was manufactured for the Mk1 Lotus Cortina at Cheshunt, but sub-assemblies and other components marshaled here for assembly. Towards the end of this section are three photographs, taken by Ron Hickman, director of Lotus and designer of the Lotus Elan. 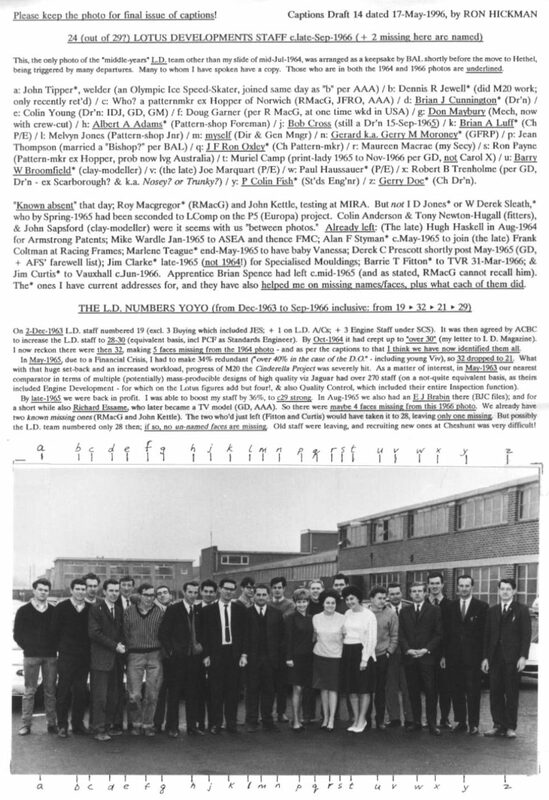 They are rare photos of the directors of the company taken in 1964, and the staff from Lotus Developments taken in 1964 and 1966. He was writing up his memoirs, and had sent these to his friend and ex-secretary, Maureen Macrae, for updating. Sadly Ron died before he could complete his work. The two main buildings are the matching pair at the front, opened in 1959. The left one is Lotus Components where Sevens were made on the ground floor and racing cars on the first floor. Access for vehicles to the top floor was via the gantry projecting from the open doorway under the the peak of the roof at the front. The small group of offices at the front on the right was primarily for customer access to Car Parts and the Buyers. Team Lotus were in a section on the right corner at the back and you can see transporters behind at the back. 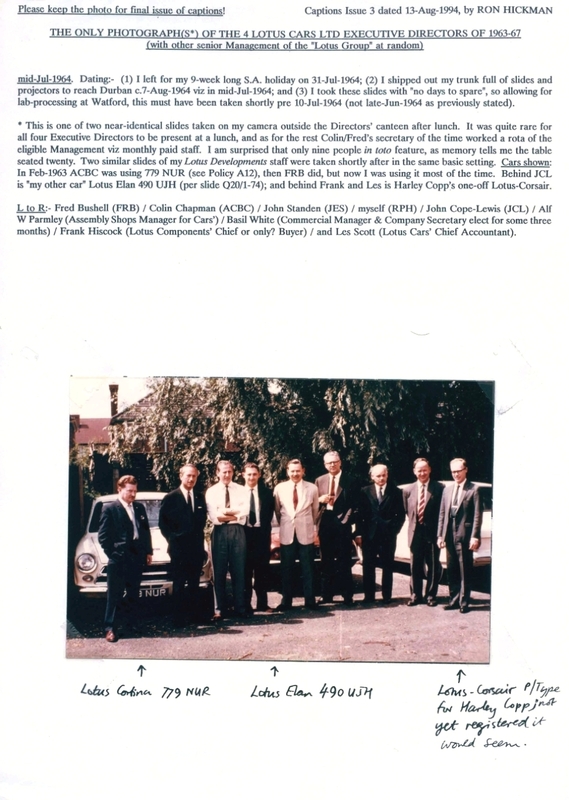 Mike Costin and his engineers were in offices and workshops ranged along the back of the building. The building at the back by the fence was the Directors’ Dining Room at the right and a maintenance store at the other end. The building on the right was Lotus Cars Assembly, initially for Elites and subsequently for Elans. The building behind was a later extension with Lotus Cars Service on the ground floor (before they moved to Panshanger) and Cortinas on the first floor complete with access ramp. Ron Hickman had his office and workshops for Lotus Developments and his staff ranged along the back of this building. At the front of the building are the offices, with Sales offices on the ground floor to the left, and the showroom on the right. Upstairs from the left was ACBC office and one for his secretary, Fred Bushell’s office, Team Lotus Manager’s office (at first Stan Kennedy-Chapman, then Andrew Ferguson), John Standen’s office as Purchasing Director, and then Accounts at the end on the right. 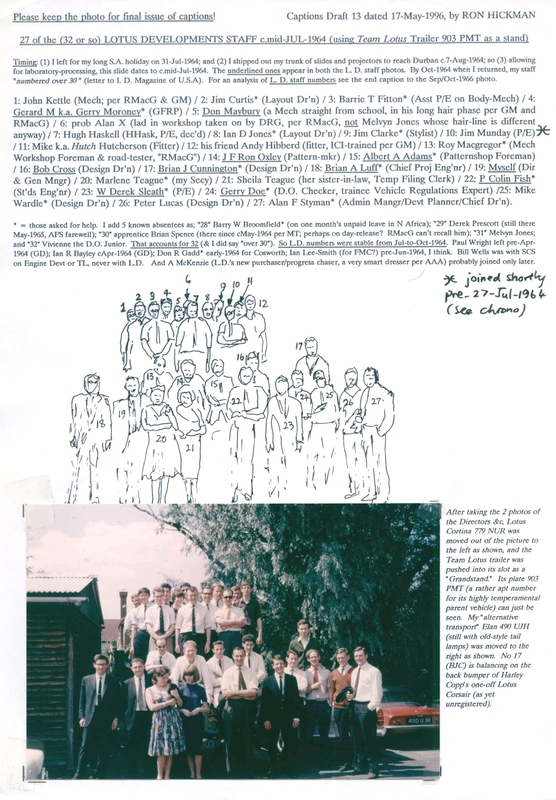 Below are the director and staff photos taken by Ron Hickman in 1964 / 66. I wonder what became of the Lotus Corsair in the photo! Ron’s notes and annotations accompany the photographs.